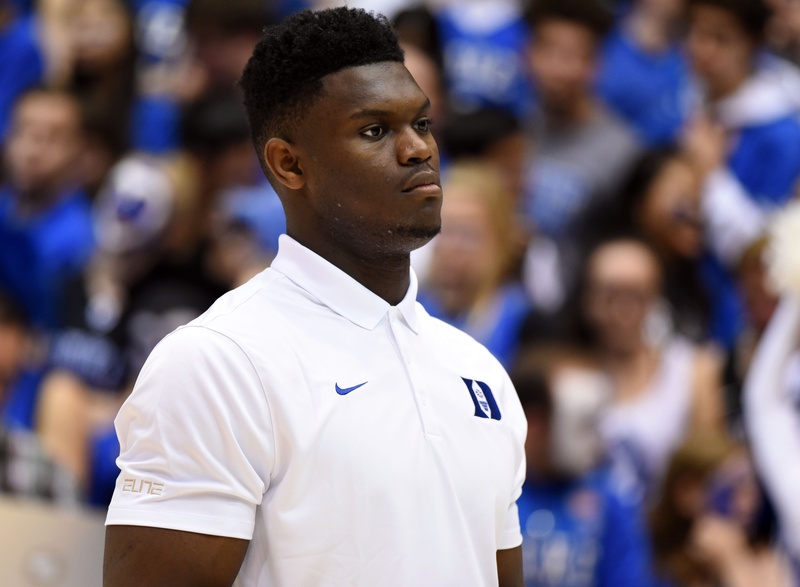 Zion Williamson suffered a knee strain during Duke’s loss to North Carolina on Feb. 20. Photo courtesy of Rob Kinnan/USA Today. Duke’s Zion Williamson went down in the opening minute of the Blue Devils’ 88-72 loss to North Carolina Feb. 20. Since that night, the ongoing debate is the following: Should Zion play again for Duke or should he “shut it down” and prepare for the 2019 NBA Draft in June? Is he risking too much to come back and chase a national championship? What is the right move? The real answer is that there is no right move. At least not in the way there is a right and wrong answer to every math problem. The right move is the one that Zion wants to make. It’s silly to suggest that someone not named Zion knows what’s best for the kid. And if we’re going to believe what he’s been saying about college, then it is clear he wants to be and play at Duke. With that being said, here’s why he shouldn’t shut it down. First, he isn’t risking nearly as much as people seem to think. As of right now, Zion is the clear-cut favorite to go No. 1 overall in the NBA Draft. If any NBA general manager skips on Zion, they might as well start packing up their office because the end is near. Quite frankly, a normal basketball injury is not going to change that, especially the minor knee sprain he suffered against the Tar Heels. He’s “day-to-day,” people. Meaning he probably could’ve played against Syracuse and Virginia Tech, but the Duke medical staff wants him 100 percent before he takes the floor again. The injury isn’t as worrisome as the back injury Michael Porter Jr. suffered at Missouri, and it isn’t an Achilles injury that can plague big guys like Zion for the rest of their career. Even if he does shut it down and not play for Duke, that doesn’t mean he is going to stop playing basketball. He’s got a chance to injure himself in preparation for the draft anyway. The risk is just not that high. And as for those who say, “he’s risking millions and millions of dollars,” you might be right, but we’re probably talking about the difference between $1 billion and $990 million. It just isn’t that substantial. Even if Zion has to ride a wheelchair into the conference room after Duke’s season ends, he is still going to sign with Nike or some other shoe company. That contract will instantly make him a multi-millionaire, even if he goes third instead of first in the draft. The difference between those contracts in the first year was roughly $2 million in the 2018-19 season, according to RealGM.com. With that being said, multiple NBA executives already told USA Today Sports that the knee injury doesn’t change their opinion of Zion, and every mock draft still has him going first overall. Now for the issue of “he’s not benefitting from playing at Duke.” First of all, false. The term “benefit” has a subjective definition, and that definition for Zion clearly goes beyond the “I’m not making money doing this.” He’s made it clear he and teammate RJ Barrett are best friends, and he would want to play at Duke even if the NBA’s one-and-done rule wasn’t in place. There’s an intangible benefit. And on top of that, there has been a clear draft stock benefit to Zion’s time in a Blue Devils uniform. In Bleacher Report’s “Way too early 2019 NBA Mock Draft” in August 2018, he was predicted to go fourth overall and a Forbes article had him going fifth. Zion wasn’t supposed to be this good, and a year of working out on his own wouldn’t have changed that stock. Zion was known to just be a ridiculous dunker, and his time at Duke has shed light on all of his talents. So, technically he’s actually made millions by deciding to go to school instead of sit out a year. So what about you, Trae? If Zion should shut it down, why didn’t you? In February 2018, you were clearly a Top 5 pick in the NBA draft. So what were you not risking that Zion is risking? I would even argue the last month of your time at Oklahoma hurt your stock. To be clear, Young didn’t suffer an injury during his one year as a Sooner, but every time he stepped on the floor, he risked the same things Zion is supposedly risking. And finally, let’s relax about the shoe busting. Nike doesn’t need to change the way they build their shoes. Nobody else in the world stands at 6-foot-7, weighs 285 pounds and moves the way Zion does. Have you ever seen a “normal” athlete have trouble with Nike shoes? I haven’t. It would be dumb for Nike to spend money making shoes that were just for basketball players of Zion’s build, because there’s only one of them. Nike doesn’t need to reconsider how they make shoes, and Zion doesn’t need to shut it down and not play at Duke. Especially if it makes the kid happy to go after a national championship during his only chance to play college hoops.